WebSite CEO is a complete professional suite for search engine marketing, Web site maintenance and traffic analysis. The program includes tools for search engine optimization and submissions, keyword research, rank checking, meta tag and content editing, site quality management and FTP uploading. · Get the list of keywords and keyphrases that will bring most targeted visitors to your site. · Optimize your Web pages for top-10 positions and superior visibility in major search engines all over the globe. · Submit your site to search engines that bring so much traffic to your competition. · Analyze and build links by performing a profound link research and then finding and contacting the best of potential link partners. · Manage pay-per-click campaigns from a single unified workspace. · Track your positions in search engines and know for sure how effective your Website promotion efforts are. · Get a ground-breaking insight into site, its visitors, and the origins of traffic. Who are they? Where do they come from? And 100 more reports! · Get rid of errors on your sites Pinpoint all errors with the detailed breakdown of problems by page. Find bad links before your visitors do. Get an excellent overview of site quality. · Easily edit your Web pages in Visual and HTML views. Get instant access to important tags without striving through HTML. Change anything on your pages with one click. · Upload any file or folder to your host without getting through sophisticated FTP routines. · Monitor the availability of your website to know when your server or host goes down to immediately react. You cannot download any crack or serial number for Web CEO Professional on this page. Every software that you are able to download on our site is legal. There is no crack, serial number, hack or activation key for Web CEO Professional present here. Our collection also doesn't contain any keygens, because keygen programs are being used in illegal ways which we do not support. All software that you can find here is freely downloadable and legal. 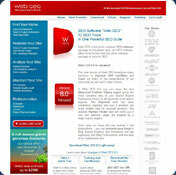 Web CEO Professional installation package is prepared to be downloaded from our fast download servers. It is checked for possible viruses and is proven to be 100% clean and safe. Various leading antiviruses have been used to test Web CEO Professional, if it contains any viruses. No infections have been found and downloading Web CEO Professional is completelly problem free because of that reason. Our experts on malware detection tested Web CEO Professional with various spyware and malware detection programs, including fyxm.net custom malware and spyware detection, and absolutelly no malware or spyware was found in Web CEO Professional. All software that you can find on our servers, including Web CEO Professional, is either freeware, shareware or open-source, some of the software packages are demo, trial or patch versions and if possible (public domain licence), we also host official full versions of software. Because we want to be one of the fastest download sites on the web, we host all the software including Web CEO Professional on our servers. You cannot find here any torrents or download links that would lead you to dangerous sites. Rate Web CEO Professional 6.5!